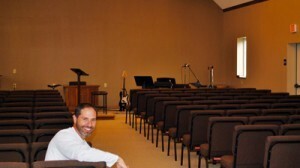 Pastor Doug Black in the newly-remodeled worship area. Pastor Doug Black and Liberty Grace Brethren Church of Johnstown, Pa., is currently featured in local publications as Liberty prepares to move into its new facility. Here is an excerpt from the article–to read the entire piece, click here. For the past five months, Liberty Grace Brethren Church has been immersed in renovations. Since acquiring Richland Christian Church’s red-brick building on Tener Street, the Liberty Grace congregation has extensively remodeled the sanctuary, bathrooms, kitchen and offices. New carpeting has been installed throughout, and chairs have replaced pews in the sanctuary. But Pastor Doug Black wants his congregation to remain focused on the community, not the building itself. The Walkers in North Carolina are excited for all of you and pray for a wonderful celebration this weekend!